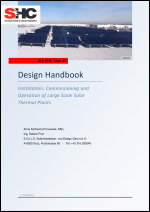 This handbook aims to provide guidance in designing best practice, large-scale solar thermal systems, geothermal heat pump systems and hybrid district heating systems. It addresses common design issues, operation and financing issues. The final chapter gives examples for successfully constructed plants.